1. Add the lime, lemon, orange, sugar and half of the mint to a bowl and crush with a rolling pin for a couple of minutes. Leave to macerate for 10 mins. 2. Now strain the juice from the citrus fruits into a small glass with ice. 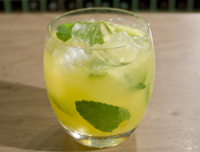 Pour in some ginger ale and add a few crushed leaves of mint.